AddressThis sale in Birmingham, AL 35242 is a "By Appointment" sale. Please see sale info below for details. Items pictured are available for pick up in Highland Lakes subdivision in Birmingham by appointment only. 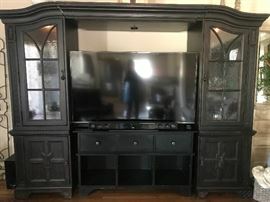 Entertainment Center - $300 This entertainment Center has two 26 inch wide side cabinets with glass doors. Each cabinet has 2 glass shelves and a 3 way light, which is controlled by tapping the hinge on the outside of the door. The 3rd piece is the bridge across the top. When the 3 pieces are attached, the bridge can slide and adjust to fit up to an 80 inch TV. The black console is a separate 60 inch piece. It has 3 drawers and 3 open compartments. Id was not an original piece of the entertainment center, but matches nicely.